Stop Asking people For YouTube Subscription | Find Out Why? It really makes me very angry when I see people who already got 50k, 100k or million+ subscribers and still begs for more subs. Come on, I know you want more views so that you get more money, but you should know many lazy subscribers don't even come back to watch every single video of yours. In this post I want to share one thing which I've found today that if someone finds your videos interesting and watches few of them, YouTube will first recommend your video to that person every time you upload one. And then when YouTube sees that he/she watches those recommended video as well regularly then it will tell that person to subscribe. As you can see in the picture above, so that person starts getting notification and not miss any of your videos. So from this we understand that you don't need to beg for subscribers like a street beggar. 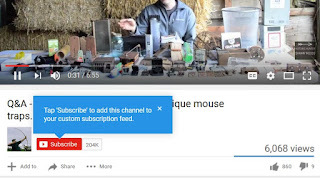 If your videos are interested enough for someone YouTube will tell them to subscribe to your channel. At the same time for the small creators it's really a life long struggle to promote your videos or channel because people (ordinary people) don't like the small channels and happy to be sheep (fans) of big channels.